Gail Pettis is a singer from the Seattle area who stepped into the jazz spotlight later in her life, only seriously turning to music in 2001 after a professional career. Her self-produced debut, May I Come In? was revelatory—hearing it for the first time was to discover a refreshing and fabulous new vocalist who made this listener a committed fan. It was a rare first recording that I still listen to and play for friends, who usually have the same enthusiastic reaction to her. Put Pettis at the top of my list of favorite singers. 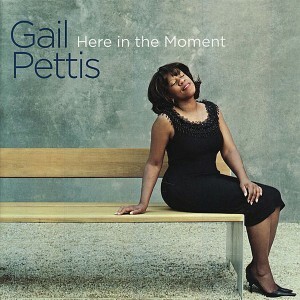 I was super excited to get my hands on her sophomore recording, Here in the Moment, and several spins later, I found myself under Ms. Pettis’s spell. Her reading of standards and American Songbook staples are consistently rhythmic and soulful and she embraces these songs with a deeply felt, emotional honesty. Best of all, Pettis puts a reliable twist on the overly familiar, and her delivery on these tuneful arrangements shake up what would otherwise be just another jazz singer’s record. Among the 11 strong tunes, “In The Still Of The Night” is a clever romp played at a jackrabbit’s pace, delightfully sung and featuring a snappy solo by pianist Darin Clendenin. The briefest tune, “I Thought About You,” is a poignant duet between Pettis and the pianist that’s simply a knockout. With a clear-as-a-bell voice, Pettis is playfully upbeat on “Day In, Day Out” and her lively trio swings for the fence. Also great is “Nature Boy,” here given a Latin-inflected treatment that highlights her gentle and refined scatting with in-the-pocket solos by Clendenin and bassist Clipper Anderson.